A helpless leopard tries to get away from a crowd of people tormenting it—running over tiled rooftops, jumping buildings and crossing narrow gullies, before settling behind a bucket in an open bathroom. All the while, the swelling crowd tries beating it with sticks. The scene, unfolding on video, held the undivided attention of participants at the first-of-its-kind awareness workshop on the ‘Role of Youth and Students in Forest Conservation’. This and other clips on man-animal conflict from around Bangalore were presented by Aparna Kolekar, a researcher with Nature Conservation Foundation (NCF) at the workshop that was conducted by the Karnataka forest department in collaboration with National Centre for Biological Sciences (NCBS), Bangalore on 14 May 2016. All state forest departments are mandated to conduct outreach programs under the Compensatory Afforestation Fund Management and Planning Authority (CAMPA) initiative of the Ministry of Environment and Forests. V Ganesh, Range Forest Officer (RFO), North Bangalore District and one of the organisers of the workshop said, “Outreach brings transparency to our system. We have to go to people if we want to solve problems. Issues of wildlife and environment are global but actions have to be local.” He added that forest departments have been conducting such programs for the last few years, but this time they felt the need to join hands with researchers to disseminate knowledge about their respective fields to young students. Varad Giri, a scientist at NCBS and the other organiser of the workshop also concurred with the view that it is the duty of researchers to communicate about their work. He said, “This workshop was a great opportunity to bridge the gap between young nature enthusiasts and scientists. It will help create a team of volunteers for our future work.” Such initiatives will also help create an understanding in the society about preserving our surroundings. The workshop was inaugurated by K N Murthy, Additional Principal Chief Conservator of Forests, Bangalore. 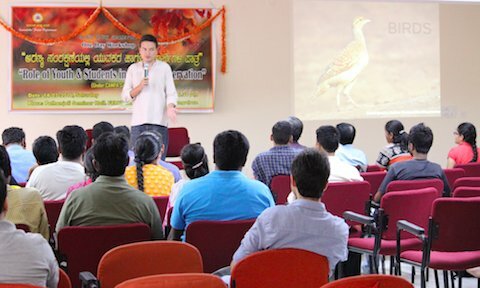 In the sessions that followed, speakers introduced a wide variety of topics related to their expertise—there were talks on the importance of amphibians in a rapidly changing world, on identifying butterflies commonly found in Bangalore, and about eBird, a citizen science web portal, where residents of an area contribute information about local birds. The audience at the workshop was a very diverse collection of 50 participants from different parts of the country. There were high school students and software engineers from Bangalore, and doctoral students and professionals from the not-for-profit sector from as far as Kolhapur and Ranchi. The participants were also spread across a wide age group—from 16 to 50. The idea behind arranging this gathering, Giri said, was to create awareness among young nature enthusiasts about simple ways to identify animals in their immediate environment. He emphasised the role of taxonomy in scientific research in his talk and listed different ways in which nature enthusiasts can contribute to understanding more about animals, taking up photography being one of them. In their presentations on reptiles and butterflies respectively, Chaitanya Krishna, an independent researcher and Nitin Rai from NCBS, got the audience excited about many new species from different groups of organisms being discovered near Bangalore. They presented the various physical characteristics with which to distinguish different species of these vertebrates. Rai explained through his research how he would like to build a butterfly community around Bangalore that contributes to research and helps understand the effects of urbanisation on these creatures. Kolekar spoke on the work undertaken by her colleagues who have radio collared five individual leopards to gather information about their movements around Bangalore. Improper disposal of waste by humans is an important cause in attracting dogs, pigs and other animals, which in turn attracts predators like leopards bringing them in close proximity to humans. This, along with other factors like depletion of forests, fragmentation of habitats by roads, expansion of urban areas, etc, are causes for animals to be in conflict with humans. She concluded by calling on volunteers to enlist with the forest department to spread the message and help in distress situations ensuring human and animal safety. One of the most engaging sessions was conducted by Suhel Quader, scientist at NCF. He conducted a bird quiz on interesting facts about birds commonly found in cities. Quader talked about why birds exhibit diverse behaviour and explained how information collected through eBird and other citizen science programs can help in scientific understanding of various aspects related to birds while also helping in devising conservation plans. At the end of these sessions most of the participants in attendance remarked that the workshop more than exceeded their expectations. Pranav and Shikhara, class X students, said that the workshop piqued their interests in biology—the sessions had simple identification keys to various organisms which made them easy to identify in natural surroundings. Sandesh Patil who runs an NGO involved in rescue and rehabilitation of wild animals in Solapur found the session on man-animal conflict useful as it contained information on ways to minimise such incidents. It also suggested means to create awareness among general public that Patil’s organisation could adopt.